To the uninitiated, like me, all flying creatures of a certain shape are dragonflies. Well, that is all we knew about them as children. I later learned that some of them may also be damselflies. The latter are more delicate and their wings are usually held back along the abdomen when at rest. 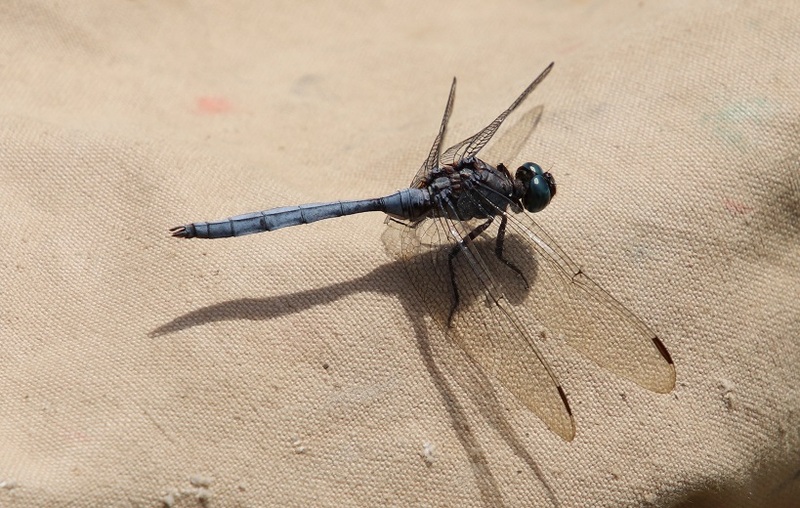 Dragonflies, on the other hand, hold their wings more or less at right angles to their bodies when at rest. 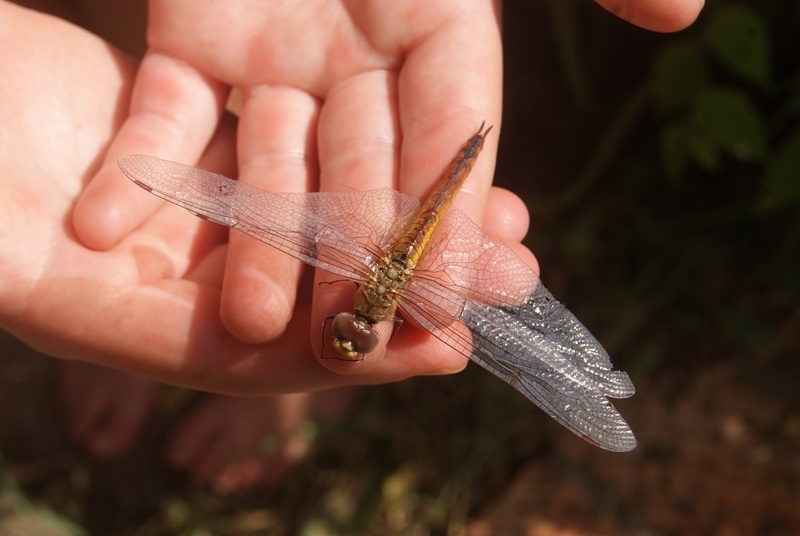 Another interesting difference between them, which I read about in Dragonflies and Damselflies by Pat Caldwell, a field guide published by The Umgeni Valley Project, is that the eyes of dragonflies usually touch while the eyes of damselflies do not. What kind of dragonfly can it possibly be? 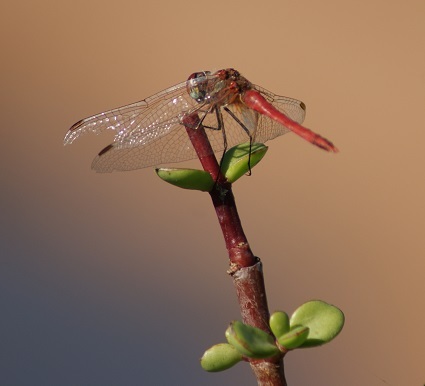 Having looked through a dazzling array of dragonflies on http://www.dragonflies-id.co.za/Dragonflies_Index.html I was astounded to find that dragonflies are further divided into Emporers, Hawkers, Emeralds, Clubtails, Presbas, Cruisers, Skimmers and Dropwings amongst others! Having drawn up a short list of five, I finally settled on this one being a Cape Skimmer (Orthetrum julia capicola) for it seems to be the closest match to the one I photographed. 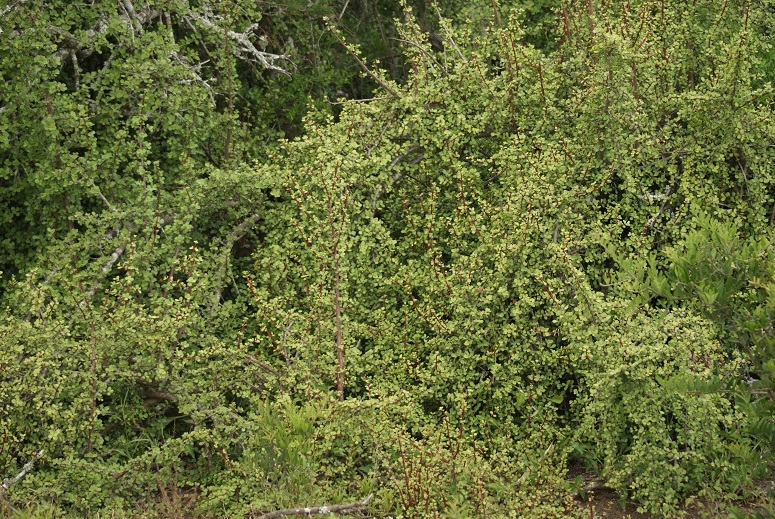 Spekboom (Portulacaria afra) grows primarily in the dry areas of the Eastern Cape. Recent research has shown Spekboom to be an excellent ‘carbon sponge’ with the ability to sequestrate (absorb) free carbon from the atmosphere which is used to make plant tissue. It does so particularly efficiently, which means that a stand of Spekboom has the ability to remove more carbon from the atmosphere than an equal amount of deciduous forest. Spekboom is unique in that it stores solar energy to photosynthesise at night. This makes it ten times more effective per hectare at carbon fixing than a tropical rain forest. Each hectare of Spekboom can capture 4,2 tons of carbon every year. 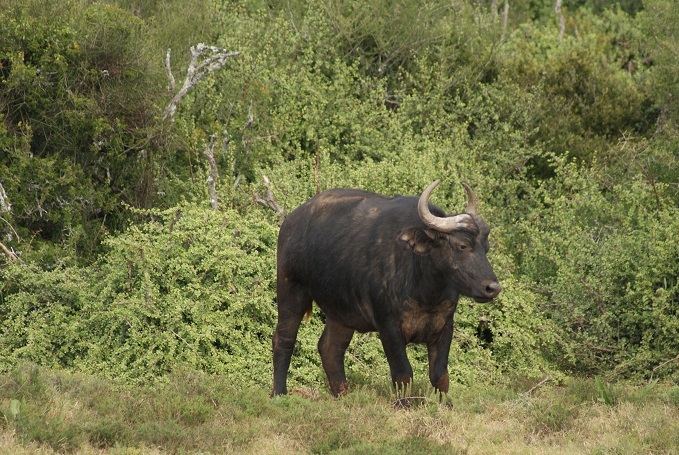 Note the thicket of Spekboom behind this Cape buffalo. 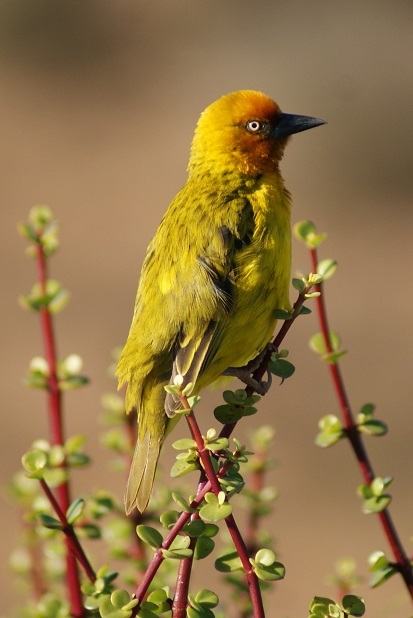 You can see the shape of the leaves of the Spekboom in this picture of a Cape Weaver. 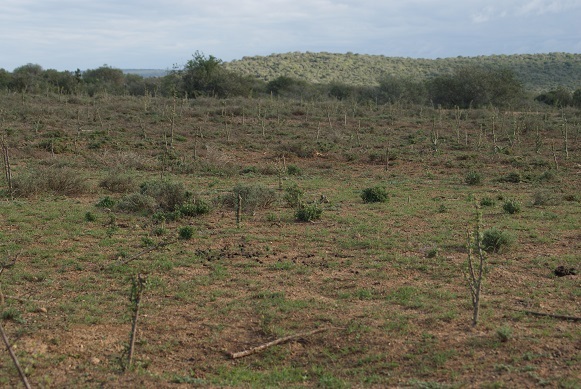 Because of its ability to capture carbon, Spekboom is being replanted in degraded thicket areas in the Baviaanskloof Nature Reserve, the Addo Elephant National Park, and in the Great Fish Nature Reserve. These projects not only help to restore natural ecosystems, but as they are labour-intensive, they provide a source of income for rural communities and thereby help to alleviate poverty. 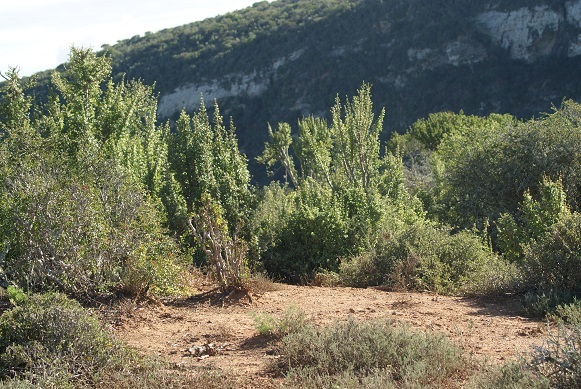 The picture below illustrates an area of the Great Fish River Nature Reserve where cuttings of Spekboom have been planted. Here you can see how other cuttings have bushed out over time. 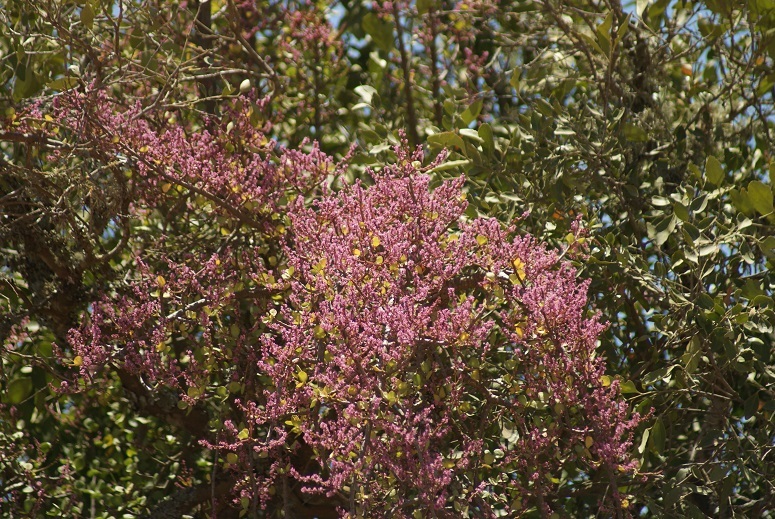 Small star-shaped pink flowers are borne en masse from late winter to spring, usually after the first rains. They are a rich source of nectar for many insects, which in turn attract insectivorous birds. 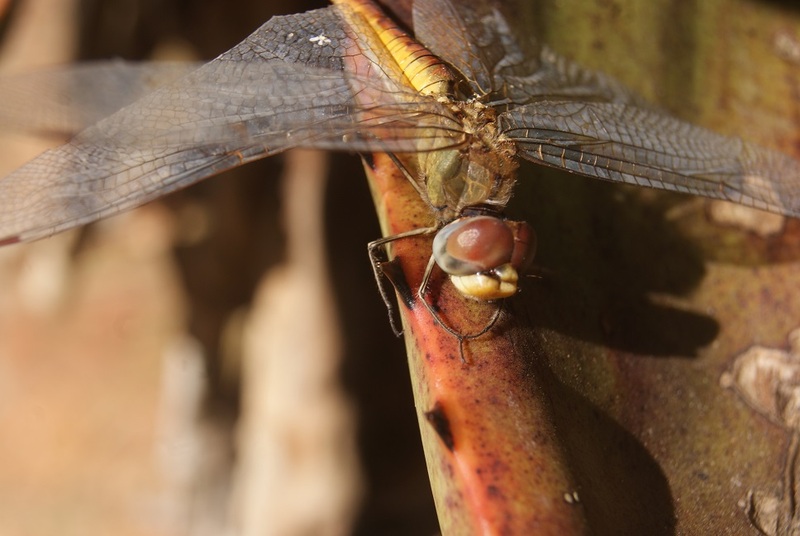 This dragonfly is resting on a sprig of Spekboom. 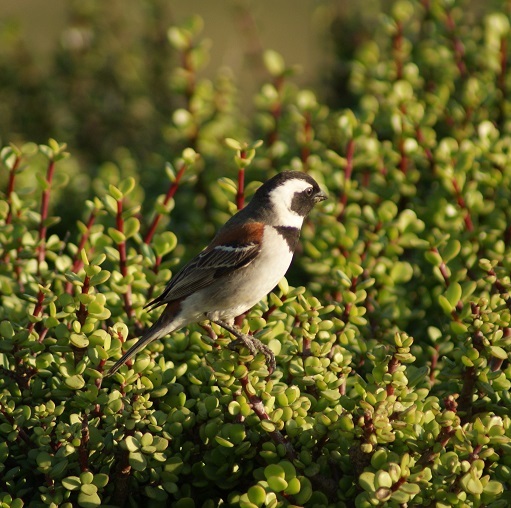 Here a Cape Sparrow perches on Spekboom. The ubiquitous dense stands of succulent Spekboom form an important part of the diet of the elephants in the Addo Elephant National Park. Their top-down browsing habits apparently help the plants to spread and thrive by promoting the natural umbrella-shaped canopy. Spekboom regenerates quickly, ensuring a regular food supply. 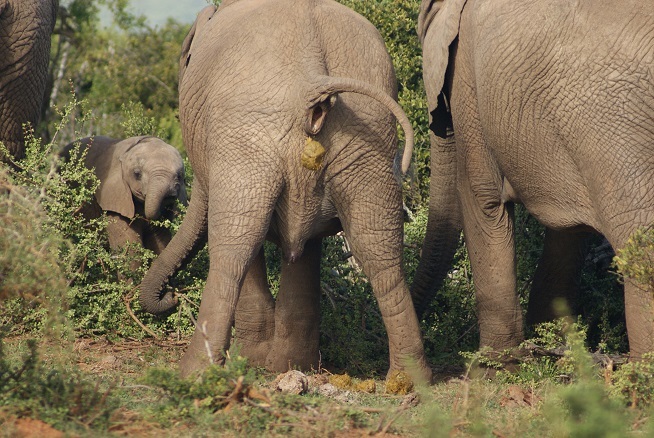 Note the baby elephant feeding on Spekboom in the picture below. January’s theme appears to be ‘rescue’. 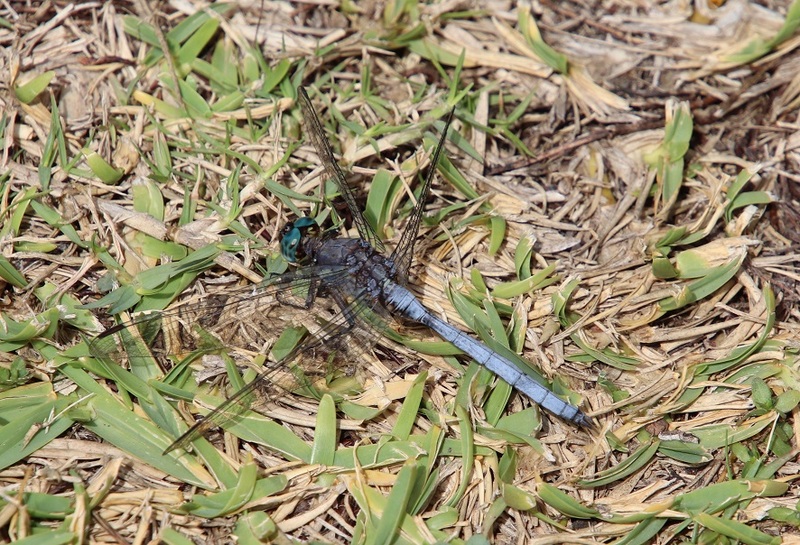 I was met by a pair of outstretched hand carefully balancing a dragonfly (is it a dragonfly?) that M had found floating in the pool, its wings seemingly glued to the surface of the water. She placed it very gently on an aloe leaf and we watched as its feelers moved; as the delicate wings spread out and glinted wetly in the bright sunlight; as they flapped experimentally; and cheered when the dragonfly fluttered a short distance to land on the brick edging of the pool. It took only a few moments for the dragonfly to regain full use of its intricately veined wings and to fly away as if nothing untoward had happened. Meanwhile, we have scoured the books on our shelves and pictures on the Internet to try and identify this pretty creature to no avail. If anyone out there recognises what it is, we would love to know!